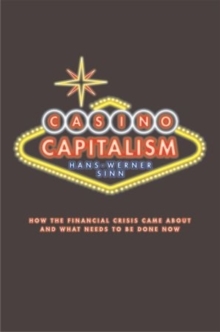 In Casino Capitalism Hans-Werner Sinn examines the causes of the banking crisis, points out the flaws in the economic rescue packages, and presents a master plan for the reform of financial markets. Sinn argues that the crisis came about because limited liability induced both Wall Street and Main Street to gamble with real estate properties. He meticulously describes the process of lending to American homeowners and criticizes both the process ofsecuritizing and selling mortgage claims to the world, as well as the poor job rating agencies did in providing transparency. He argues that the American Dream has ended because the world now realizes that this dream was built on loans that are never likely to be repaid. Sinn also asserts that the banking crisis has not yet been resolved, because the necessary write-offs of toxic assets have largely been swept under the carpet. Comparing actual worldwide write-offs with those estimated by the IMF estimates, he concludes that substantial parts, if not most, of the true losses have yet to be revealed and that the banking systems of many countries are on the brink of insolvency. In view of this, he directs sharp criticism at the various economic rescue packages, arguing that the plans assume that banks have a liquidity problem while, in fact, they suffer from a solvency crisis. Sinn points out that the conflict between the goals of rescuing banks in the short term and inducing more prudent behaviour in the long term requires the government to help the banks, but not their shareholders, by becoming a temporary co-owner. In addition, he calls for higher equityrequirements, a worldwide return to more cautious accounting methods, a ban on extremely speculative short selling, and strict regulations on conduits, hedge funds and credit default swaps. This authoritative account provides an invaluable overview for academics, students, policymakers, politicians, and all those with an interest in the unprecedented 2008 banking crisis.